The Buzzer blog » Proposed 2014 service optimization changes are live: Come to an open house or share your input online! Have your say in-person or online. Hey Buzzer Blog readers! Do you ride the 49, 116, 404, 606/608, C15 or C96? As part of Translink’s service optimization program, changes are being proposed to improve these routes. Public consultation will take place from February 3rd to 19th, 2014. TransLink will host four open houses and you are invited to provide feedback at a location near you. The full details on each of the proposed 2014 bus service optimization changes are now online! Once you’ve had a look at the route changes, fill out the questionnaire and share your feedback! 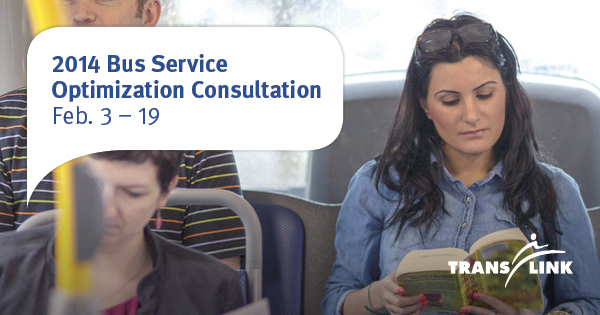 February 3 – 5 p.m. to 8 p.m.
February 4 – 5 p.m. to 8 p.m.
February 6 – 3:30 p.m. to 7 p.m.
February 13 – 5 p.m. to 8 p.m.
TransLink’s service optimization program is a critical part of managing the transit network to deliver more service with existing resources. In 2012, six million new rides were added to the system without additional investment. As a result, productivity increased by 3.4 per cent and total transit revenue grew by 3.5 per cent. Since the beginning of the program in 2010, more than 292,000 hours, or six per cent of total bus service hours in the region have been reallocated to better serve customers across Metro Vancouver! What’s the *exact* routing of the new section of the 116? It looks like the bus turns from Byrne Road onto Marine Way and then turns onto N Fraser Way and loops down to join up with Byrne Road and continues with it’s current route. I looked at many maps and they all show a gap on N Fraser Way at Abbostford Street. Service optimization? Translink should look at bus stop optimization. It’s hard to get anywhere in a timely manner when your bus is stopping every block. Other cities have put their cities on “bus stop diets” and made their bus systems more efficient without requiring any more money. Just Google “bus stop optimization”. Take, for example, the #22 MacDonald. It stops at Clarke Dr and then only 150 metres to the west there is a stop at Vernon St! Thanks for sharing the bus stop optimization resource Jimbo – I’ll share it with the planning gurus. The change to the 49 is long overdue. It’s good to see this kind of change. Do more of it! Jimbo – I said that too when we had the downtown Van survey back in June. Locally putting stops that close together is a Vancouver thing (esp downtown). I did a quick non-scientific check on a few routes I know and it looks like the distance between stops tends to vary between 300 – 350 meters. According to google that’s only a 4 – 5 min walk. Do we really need stops closer together than that??? Sheba and Jimbo – Hold onto this feedback and stay tuned for opportunities to weigh in on bus service in downtown Vancouver later this spring. There are many places where bus stops seem far too close together. #22 stops twice in the same block of Knight between King Edward and Kingsway, Burrard at both Comox and Nelson, Macdonald at both 3rd and 4th southbound, Macdonald at both 10th and Broadway northbound and Macdonald at both 5th and 4th northbound. The #17 northbound stops on both sides of 41st Avenue. The #41 stops 1/2 block east of Fraser and then again on the west side of Fraser. That last one makes some sense because the Fraser stop serves a large high school in addition to transfers with the #8. I was a “victim” of the #22 for 11 years and still use it occasionally so I’m interested in the changes that were proposed last year. I’m surprised the route wasn’t simply split into two independent branches like happened to the Granville, Oak, Main, Fraser and Victoria routes. I’d run the #2 from 16th to Knight Street Bridge and the #22 from Dunbar Loop to Chinatown. Angela – I looked at that already. That’s why I’m asking what the exact routing is. Either all the maps I looked at online are out of date, or the new section of the 116 doesn’t follow Marine Way and N Fraser Way as shown. Also I (and presumably quite a few other people here) filled out the downtown questionnaire and made those bus stop comments over 6 months ago and nothing’s changed. Why should filling out another one be any different. After reviewing the feedback from Phase 1 of the Downtown Bus Review, increasing stop spacing was a clear theme identified by customers. It is an issue that we will continue to look at in Phase 2, which begins this spring. All the feedback you have already provided will continue to help inform future changes to bus stop spacing downtown. Here is the Phase 1 Consultation summary. As a Champlain resident, I see the straightening out of the 49 as just the beginning of an overhaul (long overdue) of routes in the area when the Fraserlands development is complete. That being said, why not split the route and run the occasional bus down to 54th and along to Elliott or Victoria (call it the 54)? As for the 116, service on the Marshland section of NFW is welcomed, but rather than just going straight from Byrne to Marine could they loop it trhough the back of Market crossing? Also, I find it useful to walk over to Joffre and get the 116 when going into Burnaby and save the two zone fare. Coming back is a little more complicated, as it only runs one way on Joffre – why can’t at least one route go southbound there? Hi Bill, Your thoughts on the 116 and 49 are exactly that type of constructive input we are hoping to collect through this process. It would be great if you were able to attend the open house tonight, but if not, please do submit a questionnaire so that your suggestions are captured. Thanks! Jimbo – considering the difference between stops in Van vs outside of Van, I suspect they don’t have a standard. Sheba’s got a point. The 116 would have to go through a blocked section of road in that proposal. Better would be routing the 116 along lowland road which also serves the industry there. @Jimbo: TL’s standard stop length is 250-400 metres, but stops are closer together when warranted (eg intersections that are dangerous to cross). Thanks Kyle, Bill and Sheba for all the questions. You are all right that the proposed route would go through a currently blocked section of the road (or recently unblocked as Bill noted). We anticipate that this road would be opened if this proposed route is implemented. The maps of the industrial area are not updated online since the road is new and not currently accessible. The route being proposed may not look possible, but the planners assure me that it is. The proposed changes all seem pretty reasonable to me, especially since the savings will be re-invested to on productive routes to produce overall higher ridership- more benefit to more people. I think the straightening of the 49 route will be the most beneficial of all because that that’s along the FTN so it shaves a few minutes off more than a hundred trips per day. I do agree with the posts above about stop consolidation. @Jimbo ; @Sheba, there actually aren’t that many choices in stop spacing. You pretty much have to have a stop at major instersctions- so it has to be roughly factors or multiples of 800m (1 standard block). However, spacing that is in place now (as low as 110m on the routes I use) are definitely excessively close. Thanks for the thumbs-up Christopher M! We anticipate that the proposed change to the 49 would benefit 95% of riders on that route if it is implemented. The last time I was down there, the section of North Fraser Way between Byrne and Marshland had been opened all the way through. But routing it along the block or two of Lowland would be useful. Not everybody thinks the proposed change to the 49th route is a good idea. There are lots of seniors south of 54th whose access to the Canada Line would be reduced if they had to walk the extra distance from 54th to 49th. At the very least, why not continue to run a mix of the two versions of #49 as is currently being done? Hi BobP – This is exactly the kind of input we hope to gather during the consultation process. Please make sure you fill out a questionnaire so that your suggestions is captured for consideration. Thanks! The last series of “optimization” consultations has made me deeply skeptical with regards as to how seriously TransLink takes public input at these events. During the last set of open houses, despite overwhelming opposition, a significant amount of service was cut or discontinued entirely, including the sole route serving my neighbourhood. I offered some incredibly cheap and simple solutions for retaining some form of service to my area that were not addressed whatsoever. Hi Cliff, I’m sorry to hear that you are disappointed in the process and I’d like to provide you more details on how your feedback was used. If you like, you can share your input on these routes through Customer Relations so that your feedback is once again documented or, you can send me a detailed email (thebuzzer@translink.ca) with your concerns and I can see what I can find out for you. Cliff, your experiences sounds really negative. Translink wants to cut the route in my neighbourhood. I’ll go to the open house for sure. There’s a lot of reasons that I believe the route should not be cut (I’ll submit the questionnaire soon). But now I’m worried how big chance we can get it kept. Can somebody in translink explain to us how the decision is made? Why the overwhelming opposition, like in Cliff’s case, from the community would be ignored? Hi Lauren, Thanks for planning to attend the upcoming open house and filling out the questionnaire – your feedback is so important to the consultation process! I’m not yet aware of the details of Cliff’s situation, but I will see what I can find out. In general, TransLink compiles, reviews and assesses all the feedback received at the Open Houses and through the questionnaires. The proposed route is then further scrutinized and the planning team considers modifications to address any issues highlighted in the consultation process. As a result of customer feedback, some of the proposed changes may not be implemented. Hope this clarifies the process for you! My family lives along the #49 bus route and we feel the proposed #49 route change would affect adversely those live along Kerr/East 54 Ave./Champlain Mall.
. The proposed change would cause much inconvenience especially to many seniors in that area -and there’re several senior homes (Salvation Army, Ukrarian Lodge, to name just 2) and co-op housing complexes (e.g. Arlington Grove; Kanata; BC Housing Complex on E 58th) -who HEAVILY depend on 49 Route.
. The proposed change would mean these customers have to walk several blocks to catch a No. 49. Not ideal at all especially during bad weather seasons.
. Yes, there’s is a #26 connector route between E.49 & 54 BUT its frequency, PARTICULARLY on weekends and holidays, is very low (sometimes every 1/2 hour or even longer during evening/night time periods).
. One reason put forward for the proposed change is the revised route would be more “easily understood”. Are there many #49 route riders confused right now? Does it mean that #1 bus can only travel along #1 road. Some #49 bus currently travel along Marine Drive to UBC too. Wouldn’t that also be confusing?
. If Translink is really particular about route number clarity, can we not rename #49 to, say, #49/54, or something along that line. We normally do not cut a foot to fit a shoe.
. Another reason for the proposed change put forward is that “over 90% of the #49 riders don’t get off or on along E 54 Ave.”. Many of the residents in our area question that. Our observation is MANY riders use the #49 bus stops along E 54 -residents; students (UBC and Langara); Champlain Mall shoppers etc.
. The proposed change would reportedly save about 4 -5 minutes each trip. We’re not clear how this saving would be enough to justify the undue inconvenience caused to the residents along Kerr/E 54 Ave.
Hi Stephen – thanks for your thoughtful post. This is exactly the feedback we want to hear. Please make sure to officially submit it via the online questionnaire: http://fluidsurveys.com/surveys/translink-Z/service-optimization/. Maybe it’s because I grew up in N Delta, but the complaint about lack of bus service around Champlain because of the proposed change to the 49 is falling on deaf ears for me. Oh no, service will *only* be every 15-20 mins during the day and every 30 mins in the evening – that would be an improvement for most of the South Of Fraser. If they want to save #49 time, seriously consider put in some bus priority on the Kerr@49th light. Eastbound traffic is frequently lined up past Killarney and Westbound traffic is held back by the right turn lane and oncoming left-turn lane congestion. Tyne@49th could benefit with a westbound bus controlled left-turning light. I’m extremely disappointed that the 404 is discontinuing service to the Ladner exchange. I live in Richmond (Brighouse area) and work in the Tilbury area, and the 404 was my main bus to connect with the 640. I’ll now have to make 3 connections to get to and from work, and worry about making each one because buses are always late. I’m most likely going to have to get a car and drive, as much as I don’t want to. It just doesn’t make sense to take transit when it gets to be triple the amount of time that driving takes, traffic included. Is there are a reason why community shuttle type buses, or smaller shuttles can’t be used more in the transit system? Part of the rationale for discontinuing 404 service is only 10 people on average use to go through the tunnel, well why can’t smaller or more efficient vehicles be used on certain routes? It’s like Air Canada using a 777 aircraft on their Vancouver – Prince George route, and then cancelling it because the plane is mostly empty. For the proposed changes, when will Translink make the decision? Thanks. Hi Lauren, After we compile, review and assess all the feedback received at the Open Houses and through the online questionnaire, we will take a look at the proposed routes, consider modifications to address any issues highlighted in the consultation process and then the changes will be approved by the TransLink executive. The decision to make the proposed could be made within the next few months, but these wouldn’t be implemented until late this year or early 2015. @Thomas – I asked about the 2/22 during one of the open houses, and they told me it won’t happen this spring. Related to that: could there be a post providing an update on the progress of the remaining implementation of the 2013 optimization? Besides the 2/22, I know the 502 change and the new 503 have yet to be implemented. Good questions Eric and Thomas! Thanks for the opportunity to provide an update on these projects. The 502/503 proposal is planned for June 2014. This change will see a new express service introduced on Fraser Highway providing a faster link for commuters coming in from Aldergrove. To minimize impact on customers, service levels on the busy 502 will also be increased so there is no reduction in capacity on the route. Stay tuned for changes to the 2/22 – we are waiting for updated ridership numbers and will review this proposal this spring. The #49 UBC through to Metrotown Bus is crucial to our quality of Life here in Champlain Heights. The Inconvenient “jog” the bus takes from 49th Ave and Kerr onto 54th up to Tyne and back to 49th makes it much easier for my disabled husband and myself to access transit service and connect with the west side of Vanc. and the shopping services of Metrotown. Please do not take this away from us.